AppsFlyer now offers a new dashboard for Integrated Partners and Agencies. This new dashboard allows you to view and analyze your campaign traffic for different customers. The dashboard and reports are already filtered to your network only. 1. 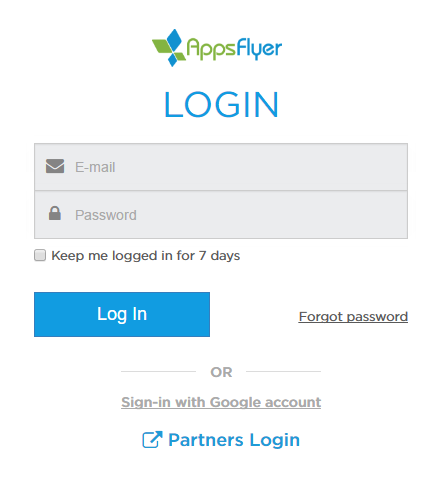 From the AppsFlyer website, click Login to enter the system. 2. The Login window opens. Enter your user name and password. You are then prompted to search for the specific app for which you would like to view the data. 4. Enter the Package Name or App Bundle ID. 5. Click Go to open the dashboard for the selected app. The first information displayed at the top of the dashboard are the KPIs for Impressions and Clicks, total non-organic installs and the conversion rate of clicks to installs. The percentages represent the trend between the time frame currently displayed and the equivalent preceding time frame. For example, if you are viewing the last week, the trend displayed shows the difference in KPIs with the week prior to the currently selected time period. Revenue data is not supported in the Partner Dashboard. To refine your search, the first thing to do is use the Language Selector at the top of the screen to choose which language you want to view your information. Currently, the dashboard is available in English, Chinese, Japanese, Spanish, French, German, Russian, Korean and Portuguese. Click Support to take you to the AppsFlyer Help Center. AppsFlyer offers you a number of filtering options to enable you to refine your search and view the information most relevant to you. Selecting yourself from the Media Source dropdown menu allows you to view all data at campaign level. Once you have selected the media source, from the Campaign filter dropdown select an option to view a specific campaign. 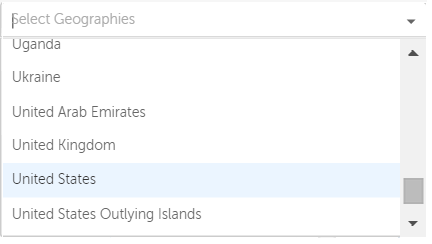 Use the Geo dropdown to select a specific geo region and view app activities for that region. Use the date selector to refine your search to specific dates. You can select your own custom data range or use one of the preset date range buttons. The User Acquisition Trends graph displays, by default impressions, clicks and non-organic installs for the app according to the filters selected. Click the icons (at the bottom of the graph) to toggle between the different values on the graph. Data in the Partner's Dashboard is presented in UTC, even if the app owner changed the time zone of the app. The next graph breaks-down the data by Campaign if you have selected yourself as the media source in the Media Source filter above. 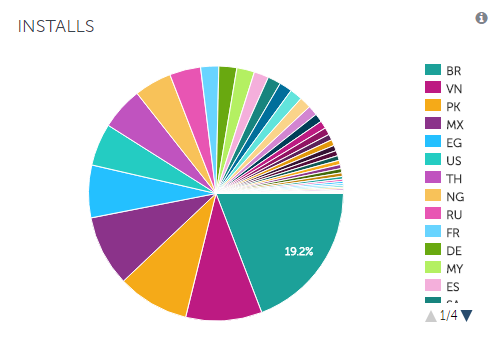 You are then shown the breakdown of Installs into graphical form for the selected time range. Continue to scroll down and the next section of the dashboard displays the Aggregated Performance Report - at campaign level. 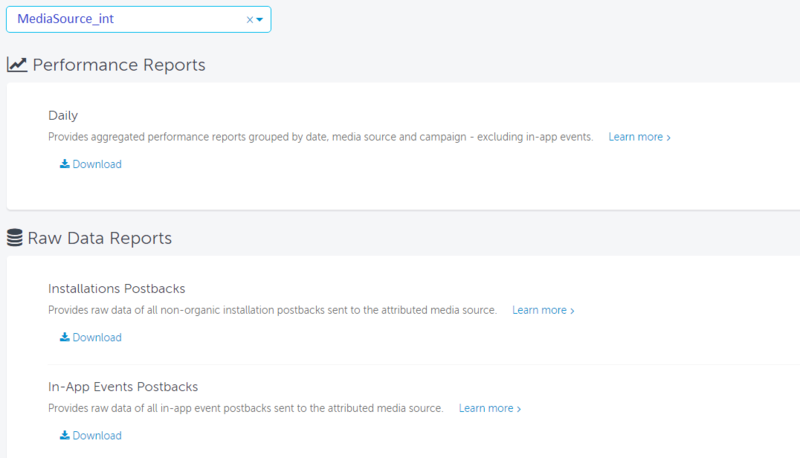 Partners do not have access to in-app event data in the dashboard, only in the reports. The next element of the dashboard is the information displayed in the Additional Insights section below the table. This information displayed is for Assisted Installs. In the example below it shows that of the total number of installs generated by you show 96.28% were direct installs and 3.72% were assisted installs to which you contributed. The bottom of the dashboard handles the Geographical Distribution of the app data. The data is divided into geographical distribution and top countries. To view report data, click on Export Data on the left hand menu bar. Click Integrated Partners on the left side of the window to view the current configuration settings. Even if you have not been granted permissions, you are able to view the configuration settings (read only mode). This applies to both the Integration Parameters tab and the In-App Events tab. Using the Permissions tab advertisers can grant different types of permissions to the ad networks. 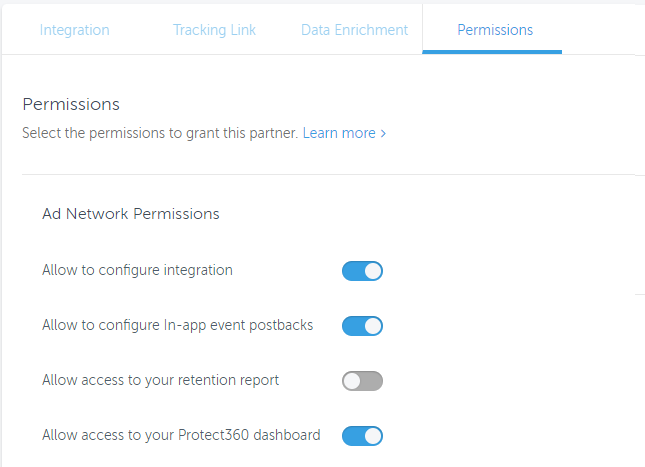 To allow this, contact your customer to select you from the Integrated Partners list and grant you access to the relevant section within the Permissions tab. When the advertiser gives permission for the ad network to configure their tracking link and map in-app events, they can enter the relevant tabs and make changes accordingly. Any changes made to the configuration overwrites the current configuration irrespective of whether it is set by the advertiser or the ad network. 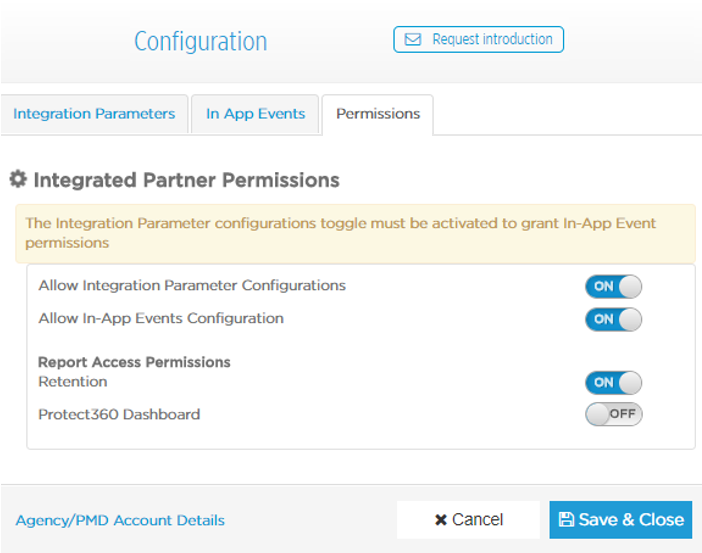 Once your client has granted you permission to the integration parameter configurations, you are able to access it from the left side of the main dashboard and selecting Integrated Partners. 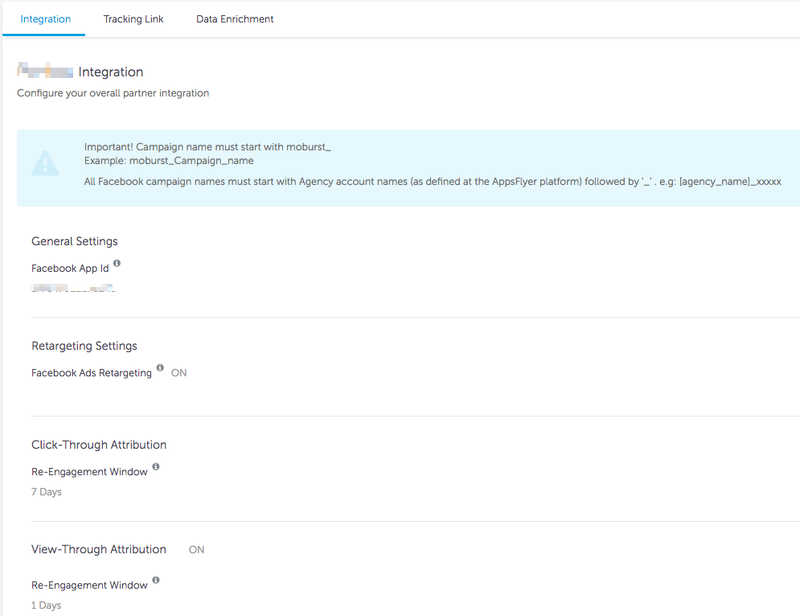 If your client has granted you permission to the Retention Report, you are able to access it from the left side of the main dashboard and selecting Retention. How to send S2S clicks to AppsFlyer?